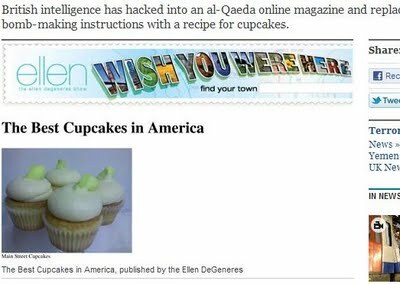 Operation Cupcake : MI6 hacks al-Qaeda website ! As part of its cyber-warfare operations, British spy agency MI6 has hacked into an al-Qaeda online magazine and replaced ''bomb-making'' instructions with a recipe for cupcakes, a media report said. The operation was launched by MI6 in an attempt to disrupt efforts by al-Qaeda in the Arabian Peninsular to recruit "lone-wolf" terrorists with a new English-language magazine, 'The Daily Telegraph' reported. When followers tried to download the 67-page colour magazine, instead of instructions about how to "Make a bomb in the Kitchen of your Mom" by "The AQ Chef", they were greeted with garbled computer code. It said: "The little cupcake is big again. Self- contained and satisfying, it summons memories of childhood even as it's updated for today's sweet-toothed hipsters." It included a recipe for the Mojito Cupcake -- "made of white rum cake and draped in vanilla buttercream" -- and the Rocky Road Cupcake -- "warning: sugar rush ahead!" By contrast, the original magazine featured a recipe showing how to make a lethal pipe bomb using sugar, match heads and a miniature lightbulb, attached to a timer. The cyber attack also removed articles by Osama bin Laden, his deputy Ayman al-Zawahiri and a piece called "What to expect in Jihad", the report said.